Last week, Scott came home from work and said, "You can feel the cooler breeze in the air. This kind of weather puts me in a much better mood!" For those of us a little less gung-ho about the end of summer, this recipe, requested by my aunt in Ontario, will help eek out the last drops of summer before turning to cooler weather fare. Hopefully you will have one of those beautiful, hot autumn evenings this weekend so that you can close your eyes, ignore the leaves that have already started to turn, and pretend it's still July! You can make both the slaw and the salsa a few hours ahead of time (i.e. before golf), and then quickly grill the fish at the last minute. This recipe makes enough for 4 small tacos, which served the two of us just fine. 4 small soft tortilla shells. 1. Mix the honey, lime juice, salt, and olive oil together. 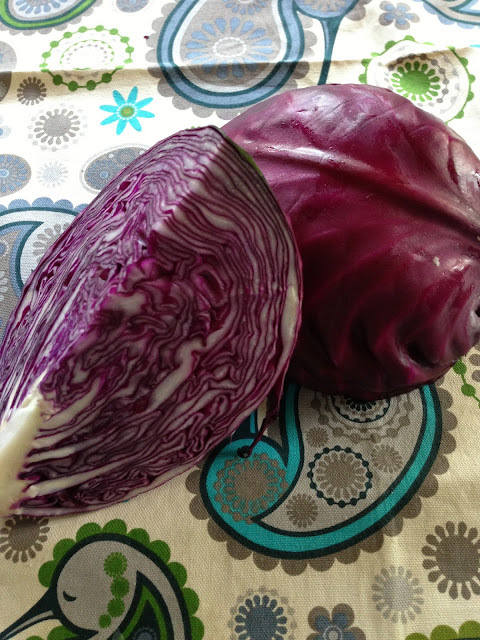 Pour it over the sliced cabbage. Cover and refrigerate. 2. Mix the mango, avocado, red onion, cilantro, and jalapeño together. Pour lemon juice and olive oil over top. Cover and refrigerate. 3. Mix the olive oil, salt, pepper, cayenne, and cumin together. Rub this paste over the fish. Cover and refrigerate. 4. When you get home from golf, cycling, jogging, etc, grill the fish on a preheated grill plate on the barbeque, or cook it on a baking sheet under the broiler in the oven. Watch it carefully so that it doesn't overcook. It will only take 5-8 minutes. Flip it over halfway through cooking. 5. 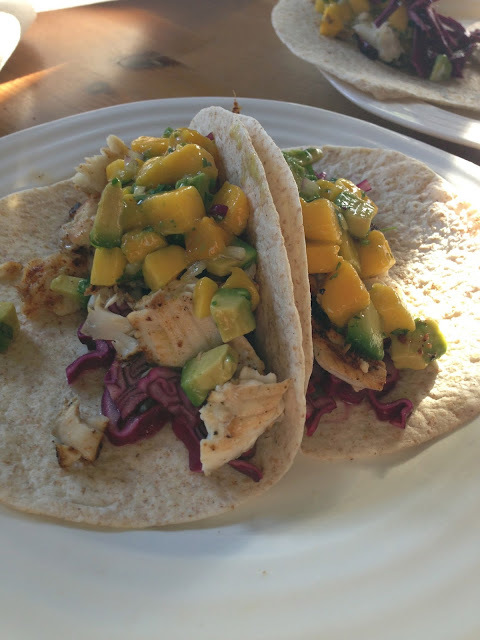 Top each tortilla shell with the cabbage slaw, half a piece of fish, and the mango/avocado salsa. Enjoy! 1. You will have half an avocado leftover. Look here for suggestions. 1. Remember that avocado should be just soft to the touch (like a peach) when it is ripe. The smaller, darker Hass variety are more flavourful than the ones that are larger and lighter in colour. 2. Jalapeños are actually quite mild, so don't be afraid of trying some fresh chilli in your salsa. The seeds and the white membrane are the hottest, so if you want less heat, just use the flesh. Also, make sure you wash your hands immediately after cutting them and avoid touching any sensitive areas! Shannon, I think I enjoy your descriptive commentary as much as I enjoy the challenge of trying the new food! This one looks highly appealing and I'll definitely give it a try. This one was excellent, Shannon! I could have eaten twice as much! You're right, I DID omit the cumin. Also, I forgot to put cilantro on the grocery list so used fresh parsley instead. I'm getting so good at this I can even make reasonable substitutions! Wow!